Can Captain Titus save the day? 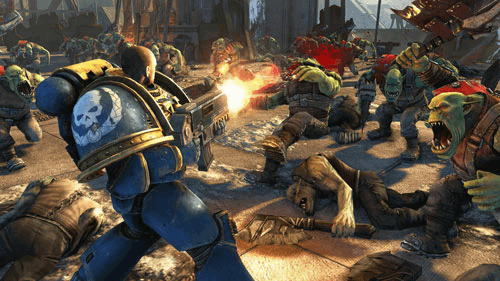 Warhammer 40,000: Space Marine is a third-person shooter/combat game that takes place in the Warhammer universe, so expect to slaughter plenty of Orks as Captain Titus of the Ultramarines. The story is pretty decent even for non-fans of the franchise like me, it has some strong moments that are surprisingly good, but what of the game itself? Well, it’s not perfect by any means. The campaign is enjoyable, but the gameplay can hinder your experience at times thanks to glitches and design choices like the finishing moves that leave you vulnerable to attack. Some areas lack variety and despite it being fun to slash and shoot Orks to bits, it does get repetitive after a while. You will get a jetpack to use in some areas, which is a great piece of kit…but you can’t use it everywhere, which is a shame and the inevitable invisible walls come into play. Outside of the campaign, there are only 2 multiplayer modes and the standard XP system that is so frequent in games today, along with the perks that you would expect to get from levelling up. The first is obviously Team Deathmatch and the other is Seize Ground, which is your standard version of Territories. 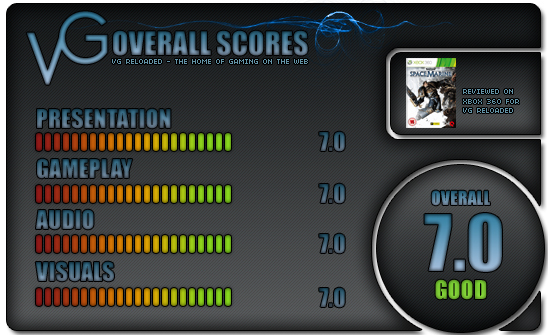 Despite the modes being pretty average, they are good fun and addictive when trying to get a massive kill streak. You can also customise your character with a number of colours and emblems to suit your needs. Presentation-wise, Space Marine lets itself down and needs some polish. The game looks average and the framerate isn’t always consistent, which is a shame. The character models are nicely detailed for fans, but they could look better. There are also a number of graphical bugs that occur, but I’m sure they will be fixed in a patch somewhere down the line. Voice-acting will please fans, but I personally found the dialogue very cheesy and clichéd. 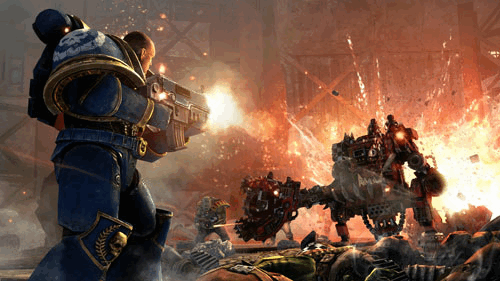 Warhammer 40,00K: Space Marine is a worthy use of the license and will please fans immensely, but I personally found it repetitive in places and I’m surprised to see only 2 multiplayer modes at launch. Will Capture the Flag or other modes be added via DLC? Time will tell. I did enjoy my time with the game, but just not as much as a fan of the franchise would. So if you do like Warhammer, then you will love what they have done.